Iowa Gun Owners, a Des Moines-based gun-rights group formed in January 2009, gave away this AR-15 assault rifle in February 2014. A man who has been reported walking around in Philadelphia's northern suburbs with an assault rifle slung over his shoulder has a right to do so, police said. The man may be attempting to draw officers into an encounter over his Second Amendment right to carry the weapon in public, Chief Patrick Molloy of Abington Township, Pa., said in a letter to township residents released Monday. "All of our officers are well aware of this passive-aggressive tactic as they have been videotaped during at least one encounter with him," Molloy said. Police had received multiple reports of a suspicious person with an AR-15 in the area of North Hills, Ardsley, Glenside and Abington Shopping Center, he said, explaining that the man's actions were lawful but had no apparent legitimate purpose, caused unnecessary alarm and were taking up police resources. Molloy said he understood people's frustration and concern but urged them not to take action and not to speak to the man. They should call police if they feel threatened. Last year, the U.S. Supreme Court refused to take up a case on Maryland laws that ban assault weapons in the state and require handguns carried outside the home to be concealed. Last month a federal judge in Boston upheld Massachusetts' ban on assault weapons, finding that each state is allowed to enact its own laws on the subject. A federal ban on assault weapons expired in 2004 and was not renewed. 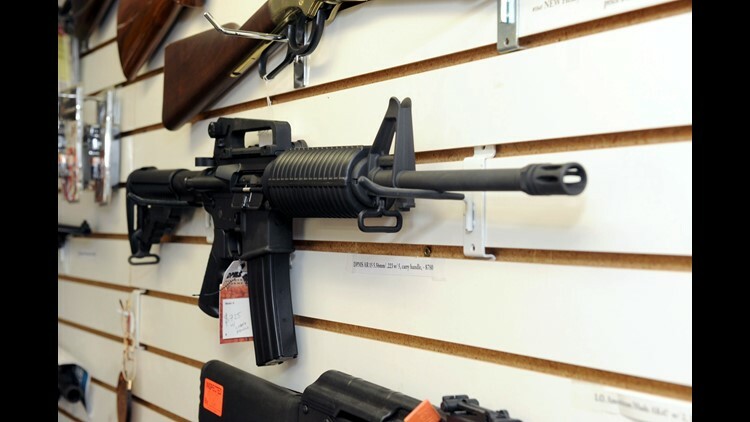 Seven states — California, Connecticut, Hawaii, Maryland, Massachusetts, New Jersey and New York — have laws banning assault weapons; Minnesota and Virginia regulate assault weapons, according to the Giffords Law Center to Prevent Gun Violence. On Tuesday, students at schools across the USA walked out of classrooms Wednesday to show their support for the Second Amendment. "Our department will continue to balance our duty to protect the Second Amendment rights of this individual with our duty to provide public safety to all of our residents," Molloy wrote. Police are continuing to investigate the incidents.